We also offer our Spacesaver staircases in Flatpack form aswell as saving you money the main benefit for offering these staircases in a flatpack is access. Spacesaver staircases are usualy positioned in some of the hardwest positions in the house to get access to and often require to be installed between walls, in these circumstances sometimes only a flatpack will do. Flatpack Spacesavers - Typical Delivery within 10 working days. 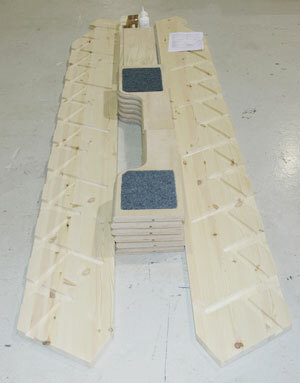 Specification:- 32mm Engineered pine strings / 30mm MDF treads / 12mm MDF risers. Construction:- Both the Treads and the Risers are recessed into the strings these are fixed from the rear / Risers are also to be screwed to the back of the treads and fit into a groove on the underside of the tread above. Budget Spacesaver Order Enquiry form. Specification:- 32mm Engineered pine strings / 24mm Birch Plywood treads / 9mm Birch Plywood risers. Birch 24 Spacesaver Order Enquiry form. 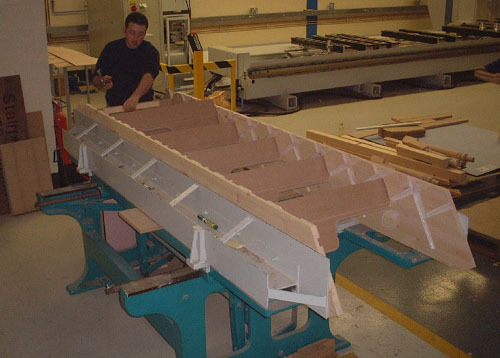 Here is a picture of a Budget spacesaver staircase being assembled in our workshop. We offer a wide range of spacesaver staircases full details of sizes and prices can be found on the main spacesaver page. How do I order ?.. Look at the Pound Saver Space Saving Staircases. 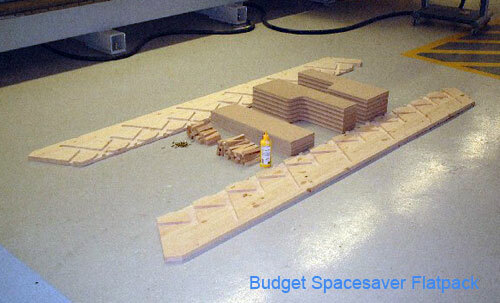 OAK 40 Spacesaver : "OAKSAVE"